Smart strategies for inclusive green growth take advantage of immediate benefits, avoid locking in unsustainable practices, offer the right incentives, and find innovative ways of financing projects. The new report Inclusive Green Growth: The Pathway to Sustainable Development provides practical steps to get there. Current growth patterns are not just unsustainable; they are also deeply inefficient. As a result, they stand in the way of sustainable development and its objectives of social, environmental and economic stability. What is needed is inclusive green growth – growth that is efficient in its use of natural resources, clean in that it minimizes pollution and environmental impacts, and inclusive for the population. Greening growth requires good growth policies adapted to political realities and entrenched behaviors. It entails reforms in the patterns of pricing, regulation, and public investment that trigger resistance. But it also requires changes in behaviors and social norms because, even with efficiency gains and new technology, changes in consumption patterns will be needed—especially, but not uniquely in high income countries. And it requires carefully deploying social marketing tools and making financial tools available. In the new report Inclusive Green Growth: The Pathway to Sustainable Development, World Bank economists set out an economic argument and framework for greening growth. The report examines the inefficiencies that offer opportunities for cleaner growth; explores the need to navigate between market and governance failures; looks at the roles of human, natural and physical capital; and filters those lessons through a political lens to extract green growth strategy and policy recommendations. At its heart is a three-pronged strategy for tackling the risk of lock-in, entrenched interests and behaviors, and financing constraints that can stand in the way of inclusive green growth.
" The current model is not just unsustainable, it is inefficient. Improving it is good economics, so let’s fix market failures, internalize externalities, assign property rights, improve governance, and influence behaviors. " Green growth policies require governments to do a better job of managing both markets and governance. Inclusive green growth strategies and policies must be tailored to a country’s circumstances—its physical endowments, its social, economic and environmental challenges, and its institutional capacity. Even sophisticated administrations may struggle with some market-based instruments, as experience with the European Trading System has demonstrated. The optimal solutions will differ across countries with varying degrees of institutional capacity, transparency, accountability, and civil society capacity. 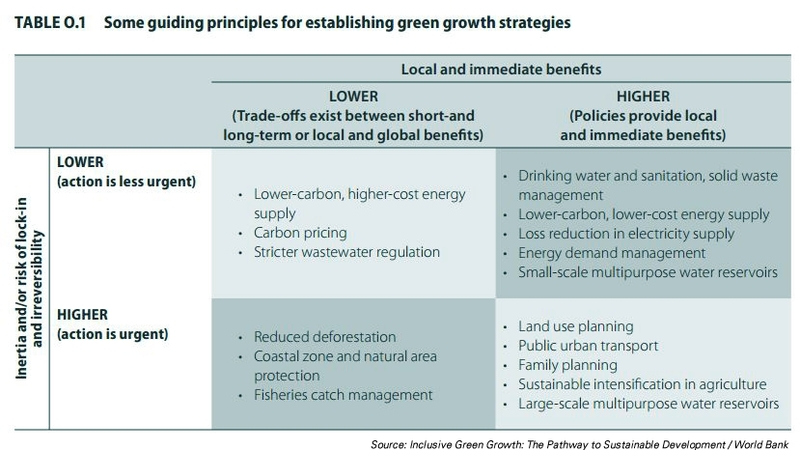 Maximize local and immediate benefit: Green growth strategies need to address the political economy of reform as wll as the urgent needs that characterize most developing countries. Designing policies to maximize immediate, local benefits that are visible, such as increased efficiency and productivity, safety and resilience, job creation, and poverty alleviation, can help ease the transition. Avoid lock-in: Strategies should also focus on the sectors and interventions that are most urgent—those that can help to prevent irreversibility or reduce inertia. It is easier to build up renewable energy later than to attempt to reverse poor land-use planning that has resulted in sprawling cities. Good land-use planning and urban public transport also provide important local and immediate benefits by reducing congestion and favoring denser, more energy-efficient development. Actively manage the political economy of reform: Sound information and data about winners and losers enables an information campaign and compensatory measures to be tailored to potential critics. One way of improving public decisions and priority-setting is to inform decision makers of the value of the services provided by natural ecosystems, so the value can be compared directly with the economic costs and benefits of their decisions. Natural capital accounting can help decision makers understand trade-offs between economic interests and natural assets, such as the loss caused by building a road through a rain forest. 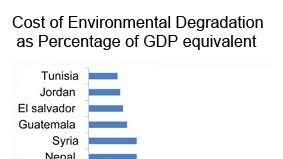 China’s growth would be much lower than its official GDP growth of nearly 10 percent a year if environmental depletion and degradation were included. While the information provided by green accounting can help inform the debate on political choices and public investments, it does not constitute an incentive. Influencing people requires sharing information, collecting reliable data, and making the right choices the easy default for the population, as well as providing safety nets for the poor when prices are realigned, such when subsidies are removed. Companies also have a major role to play in providing solutions to green growth. Through their capacity to innovate and adjust their production processes, they are key to controlling the cost of green policies. Governments need to influence their behavior, as well, by providing appropriate incentives and regulations. Use information: Companies are subject to pressures from their customers, stakeholders, and investors, and this pressure can be used to green their behavior. Promoting transparency and access to information on environmental impacts can create social pressure to reduce these impacts. In China, Indonesia, the Philippines, and Vietnam, performance evaluation and ratings programs that reported emissions data and assessed plants’ environmental performance helped a large number of plants initially rated as “noncompliant” rise to “compliant” (in contrast, plants rated as “flagrant violators” and “compliant” stayed in those categories). Impose where it makes sense: Market and price instruments can be difficult to implement and enforce, they lack predictability and credibility over the long term, and they may be inefficient when economic actors do not take them fully into account, such as not fully valuing fuel economy when buying a car. This is why it is sometimes easier to implement norms and regulations, as Australia, Canada, China, the European Union, Japan, Korea, and the United States have done for car fuel efficiency standards. Use innovation and industrial policy, but with caution: Prices are notoriously limited instruments for transforming economies or triggering investments with long-term or uncertain payoffs. Since they depend on government actions, they have long-term credibility and predictability issues. They also cannot address the “classic” market failures that are usually invoked to justify innovation or industrial policies: increasing returns and knowledge externalities in new industries, information asymmetries, capital market imperfections, and the coordination needed across different sectors to permit a technological transition. As a result, most countries resort to some form of innovation and industrial policies in their growth strategies. Such policies need to be used with care and tailored to the country context. The best way to accelerate technology diffusion is to reduce trade barriers. In China, photovoltaic panel fabrication technologies were introduced mainly through the import of manufacturing equipment from Europe. Also critical are policies to increase adaptation and adoption capacity through education and training as well as trade and industrial policies, such as local content requirements. Several developing countries are pursuing green industrial policies—biofuels in Brazil and solar energy in China and Morocco. Lessons from past successes and failures of standard industrial policies are clear: governments should subject companies to competition, have clear sunset clauses, and focus on well-identified market failures, spillover, or latent comparative advantages, such as solar potential in North Africa. But most green industries will require some type of policy support. Typically, environmental policy, such as a carbon tax, should address the environmental externality, while the standard tools of innovation and industrial policies are used to address knowledge externalities and other market failures such as economies of scale and coordination failures. Even when environmental or green infrastructure policies and investments pay for themselves, they can involve significant up-front costs and require specific financial tools. For this, innovative financing is urgently needed. Recent estimates for climate change mitigation suggest that a package of public sources—including a redirection of subsidies currently destined for fossil fuels; multilateral development bank flows; and carbon offset flows—could leverage some US$200 billion to US$400 billion in 2020 in additional private flows. This is close to the expected investment needed to stay below 550ppm CO2-eq, but about half of what likely will be needed to stay below 450 ppm CO2-eq. Many of the needed investments could benefit from public-private partnerships. Private participation in infrastructure has grown at a steady pace, about 13 percent a year, over the past 20 years, but it remains concentrated in a few middle-income countries and a few sectors. New investments in renewable energy are largely private—some US$143 billion of the US$211 billion invested in renewables in 2010—but 82 percent of private renewable energy investments that take place in developing countries occur in Brazil, China, and India. The need for innovation, efficiency, and “smart investments” (smart grids, smart transportation, and smart houses) makes the role of the private sector even more critical in green growth policies than it already is in traditional infrastructure finance. The scarcity of resources to prepare projects and bring them to a stage at which they are “bankable.” Developing-country governments are often reluctant to borrow to prepare uncertain projects, while private investors are unwilling to invest in preparing a project they may have to bid for and not win. The mismatch between the tenor of the funds available given the preference of investors for short-term funds, and the needs of infrastructure for long-term funds of 15–25 years. Few developing countries have well-developed capital markets or banking institutions able to transform short-term deposits into long-term products, and not enough refinancing tool options are available. The challenge of cost recovery. The ability to charge at full cost is behind the massive expansion in telecom services. Few other infrastructure sectors are able to do so, although where they have, investors have come, as they did in Colombia’s water sector. Solutions include measures to price infrastructure services close to cost recovery, while ensuring affordability for low-income households. Another weakness springs from the additional policy risk created by the fact that the profitability of green investments is often dependent on public policies, such as feed-in tariffs or environmental taxation. Spain’s retroactive reductions in solar feed-in tariffs, and Germany’s and France’s decisions to reduce the amount of support for future projects, plus the lack of progress on a U.S. energy bill all combined to depress the private sector’s appetite for renewable energy investments in 2010. As a result, clean energy share prices dipped, reflecting investor concerns, despite continued strong government support for renewable energy in China. Renewable energy and energy efficiency illustrate the need for innovative public financing instruments. Renewable energy is capital intensive with a long payback period. 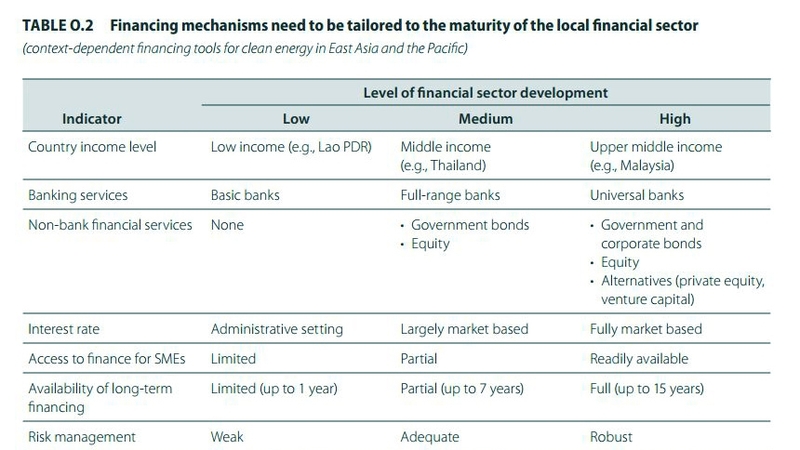 Energy efficiency suffers from the fact that most local banks rely on balance sheet financing, rather than project-based financing that is based on the cash flow generated by the investments. The public sector, international financial institutions, and bilateral donors can help by providing funds for project preparation as well as concessional elements for pioneer investments. Such support can go a long way toward changing risk-return profiles and giving investors more confidence in the long-term viability of their projects. Credit lines or guarantee instruments to engage private banks. The experience of the International Finance Corporation is telling: between 1997 and 2011 some US$65 million in concessional funding, primarily for risk-sharing facilities, generated US$680 million in sustainable energy finance investments. Public funds to reduce interest rates for consumer financing, typically through financial institutions or utilities. In addition, energy service companies, which provide clients with energy auditing, propose energy-savings measures, and financing, can help consolidate multiple small transactions. Payments for environmental services—by which farmers and landowners are compensated for maintaining their land’s ability to provide ecosystem services, such as the regulation of water flows, water purification, control of soil erosion, and habitats for wildlife—are also promising, but underutilized. This report approaches green growth from a pragmatic point of view. The current model is not just unsustainable, it is inefficient. Improving it is good economics, so let’s fix market failures, internalize externalities, assign property rights, improve governance, and influence behaviors. The costs will depend on the degree of ambition. Rapidly and dramatically decreasing our impact on the planet would be very costly. So, too, would delaying action that leads to greater expenses down the road. Neglecting natural capital, like neglecting human and physical capital, is simply bad management, bad economics, and bad for growth.